Spend New Year's at Georgia's Blue Willow Inn or make their famous collard greens at home. A classic Southern recipe from the famed Blue Willow Inn in Social Circle, Georgia. The film version of Truman Capote's masterpiece novella was added to the National Film Registry of the Library of Congress yesterday. What's for Christmas Eve dinner? 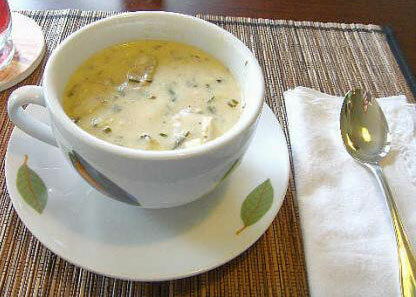 How about this decadent soup from Chef Emeril Lagasse. 6 egg whites 1 tsp. cream of tartar 2 cups sugar 1 tsp. vanilla 1 sleeve saltine crackers, crushed 1/2 cup chopped pecans Topping: 1 small container whipped topping 3 Tbsp. sugar 2 Tbsp. crushed pineapple Beat egg whites until fluffy. Add cream of tartar and sugar. Beat 25 minutes or until stiff. Stir in vanilla. Stir in crackers and pecans by hand. Spray two pie pans with nonstick spray. Divide mixture evenly between pans. Spread mixture in pan, forming a crust. Bake at 285 degrees for 25 minutes or until done. Combine topping ingredients. Pour into pie shell. Serve and enjoy.